A.K.A. the camera that never blinks. Traditional digital SLR cameras take the nicest photographs around, but they're hobbled by a decades-old technical limitation: when you snap a picture, the mirror that's been redirecting the image to your eye and to a focusing sensor pops up momentarily as the image is captured. Until it goes back down, the camera can't focus. 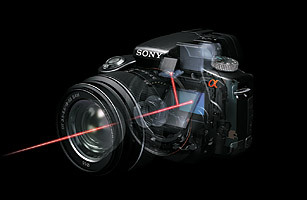 Sony's Alpha A55 ($849.99 with lens) fixes that with an ingenious translucent mirror that stays put. That means you can shoot up to 10 perfectly focused photos a second and record HD video that never goes blurry. Bonus advantage: with no need to allocate interior space for a moving mirror, the Alpha is noticeably smaller and lighter than its Sony SLR brethren.